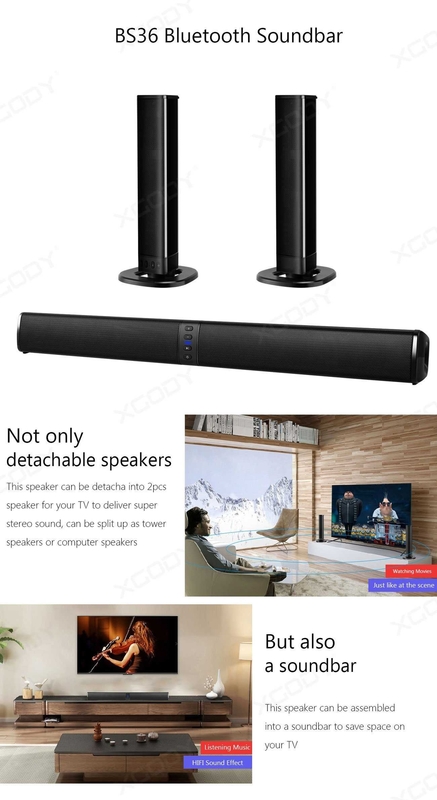 21-Inch 20 Watt 4.0 Channel AUDIO Soundbar – Completes your home theatre system with 4 full range high quality speakers, offering the powerfull sound, and with the outlet design, bring your the passtive bass and clear stereo sound quality. A MODERN LOOK – Constructed with robust material to last years, with the slim design that suits for any home and will save space for you,elevating your standard living room into a personal theatre system so you’ll never watch a film anywhere else. 21’’ ultra-slim Sound Bars are designed to blend in with a wide variety of placement options,easily fits with any 21’’ + Class TV. Bluetooth 4.0 – With Bluetooth 4.0, the sound bar can pair with your device in seconds, Bluetooth module adopts rf technology, you can control your soundbar from any where in the room with your phone. The BS36 provides a innovative way to deliver immersive room-filling sound. The detachable speakers design gives you the versatility in placing the speakers in a horizontal layout at the base of your TV or as two separate free standing vertical speakers. BS36 is compatible with your TV, Phone, Laptop, Echo thanks to Bluetooth or wired connections that include 3.5mm audio cable, USB, RCA cable, also with TF card playing function.